Whole House Music systems, also known as multizone stereo systems have become very popular. There are several ways to distribute music throughout your home including wired and wireless, powered and non-powered and this article provides an overview of the various systems. In some cases, you can use your stereo receiver or home theater receiver as the center of the system or install a dedicated multiroom music system. Multi-Zone / Single Source Systems Using a ReceiverThe simplest multizone system consists of a Speaker A/B switch that’s probably built into your stereo or home theater receiver. Install speaker wires between the receiver’s Speaker B terminals and two additional speakers in another room and you have a multizone audio system. It is also possible to connect the receiver to more speakers if you install a speaker switcher with a selector for each room. Multi-zone means multiple rooms and multi-source means the ability to listen to different sources in different rooms simultaneously. Multi-Zone / Multi-Source Systems Using a ReceiverIf you own a newer multichannel home theater receiver you may be able to take advantage of its built-in multizone/multi-source features. Many receivers have multiroom outputs that can provide two-channel audio (and sometimes video) to as many as three separate zones. In some models, the audio output is speaker level so all that’s necessary is speaker wire and two speakers in each of the rooms; or the audio output is line level (unamplified signals), which will require line level cables between rooms plus an amplifier and two speakers. Advanced MultiZone / Multi-Source Control SystemsA multizone control system is essentially a switch box that allows you to send a selected source (CD, FM radio, tape, etc.) to a specific room in your home. The control system can be a device that sends a line-level signal to an amplifier in the remote room(s), or it can have built-in amplifiers that send speaker level signals to the selected rooms(s). All of these types of systems allow you to listen to different sources simultaneously in different zones and are available in many configurations from four to as many as eight or more zones. Whole House Audio NetworkingIf you are fortunate enough to own a home with network wiring already installed, you’ve already got a huge advantage. The same type of wiring used to interconnect a computer network system can distribute audio signals to multiple zones. This type of wiring is known as CAT-5e (Category Five-Enhanced) and is capable of distributing audio signals, though it cannot be used simultaneously for a computer network and audio distribution. Using a Computer LAN to Distribute AudioAs mentioned, you can’t use the same CAT-5e cables as your computer network to distribute audio, but you can use your computer to distribute audio over your CAT-5e network in the form of MP-3 digital audio files or Internet radio. This is a low-cost solution especially if you already have a computer network installed. Wireless Music DistributionIf you don’t have a pre-wired home and retrofit wiring is too much to consider, there is another solution – go wireless. 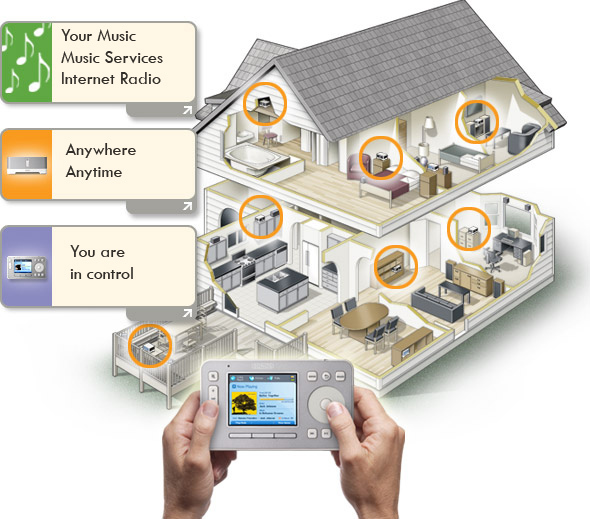 As wireless technology has improved, so have the options for wireless distribution of music. The most common wireless technology is Wi-Fi (Wireless Fidelity). No doubt you have heard the term used for the wireless networking of computers. The same technology is now finding its way into home audio. Wireless Music AdapterThe simplest way to have wireless music distribution is to install a digital media adapter. This adapter, connected to your PC, sends a Wi-Fi signal to another adapter connected to your multizone home theater receiver, enabling you to listen to music in a remote zone that uses your computer as a source.